"For one thing, in the larger scope of things, it's not much money. Fifty million dollars, in a hastily assembled $800 billion stimulus, is just a bubble on a wave. It's a rounding error, a random fluctuation. It doesn't mean that arts support runs deep and strong. The battle for the arts has been going on for decades, and in my view -- as a person in the arts myself -- the arguments we make aren't nearly strong enough? I agree that arguments for the arts could and should be re-tooled in this fast paced society that is obsessed with Pop Culture. A good Public Relations strategy would stand us in good stead. However, if you witness a drop of water fall into a clear lake, you'll see ripples that start at that drop and continue outwards. To me, this is 50 million drops into the artistic lake. * The Met's Curse of the Anvil... In his review of the Met's new Il Trovatore Anthony Tommasini says the curse is broken. This Lyric Opera of Chicago production is new to the Met, and it apparently works. 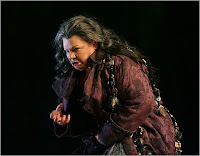 Tommasini goes on to surmise that this may not be the most imaginative or visually striking “Trovatore.”, but it is a "clear-headed, psychologically insightful and fluid staging".